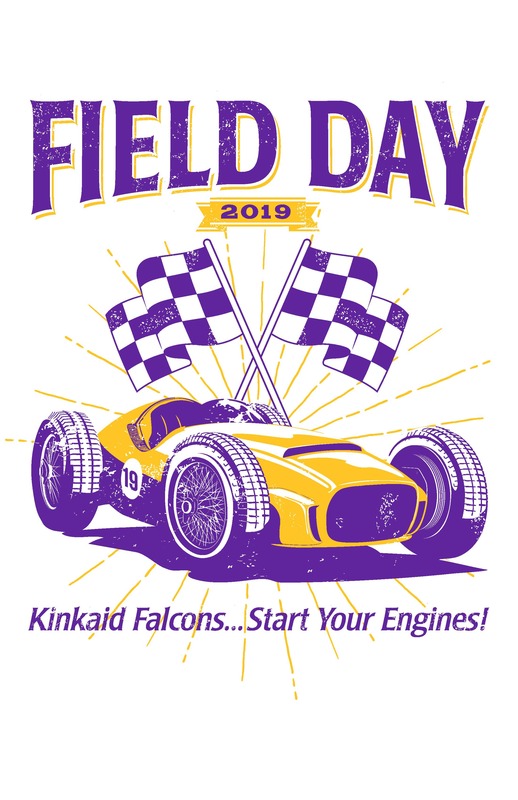 Field Day is one of the oldest and most beloved traditions at Kinkaid, having first been held in 1925. It is a special day when all students gather for field competitions and later celebrate with a carnival. Please contact Kristen Weber at 832.746.6980 or kristenweber@mac.com. How do I get a Field Day shirt? Is my child Purple or Gold? Who can come to Field Day? What goes on during the field events? What goes on at the carnival? What do tickets and wristbands cover? How much do they cost? Where do I get tickets/wristbands? How can I volunteer to help and/or donate? ALL students (except Seniors) will wear a Field Day t-shirt (ordered through the Back-to-School One Stop Shopping or from any prior year) or a plain white shirt with khaki shorts. They also may wear other spirit items such as purple and gold socks, hair bows, bandanas and sweatbands! Seniors may wear their college of choice t-shirt. Field Day t-shirts were ordered in the Back to School One Stop Shopping. If you are not sure if you ordered one log on to the portal, click on the Veracross link and click on the Charge Summary under Portal Links to see what you have purchased. If you see that you did not order a shirt, please contact Paula Kekish at paulak33@hotmail.com. Something comfortable and cool! Most parents wear either Purple or Gold in support of their child/children's team! Lower School Students: teachers have a list of which team your child is on. Middle School Students: teams will be posted in the Middle School locker rooms. Upper School Students: teams will be posted on their announcement/advisory boards. Siblings are assigned to the same team – no one wants a house divided! And once assigned to the Purple or Gold team, your child will always be on that team – so it’s Purple or Gold forever! Parents are encouraged to attend both the field events and the carnival. It really is a special day for the whole family to enjoy together! Siblings and Grandparents may also be invited to share in the fun of the afternoon! Unfortunately, no pets are allowed. Field Day begins as the Purple and Gold teams march out on to the football field. Get your camera ready because it is quite a sight! After the opening remarks, the games begin! Field Day will start with the Pre-K circling the Maypole and then will proceed through all grades until the final event, which is the exciting and much anticipated Senior Tug-of-War. After the conclusion of the field events, the Carnival opens! We will have carnival games and rides for all ages, such as the popular Melt Down, the Crocodile Slide, Bungee Trampoline and the Trackless Train! There is a water slide and your child may get wet so come prepared with a towel in your car! Of course, we will have all of the Falcon favorites such as Bingo (in the Ogilvie Family Lobby), Pick-A-Chop, the Dunk Booth, Win-A-Fish and the Pocket Lady. And get ready to eat! We have tons of food booths where you can find tacos, burgers, pizza, hot dogs, frito pie, sno cones, cotton candy and dippin’ dots. You must stop by our Falcon Bakery and buy some homemade goodies baked by Kinkaid parents and grandparents. And don’t forget to see the ladies at the Sugar Shack! Dance to the DJ’s terrific tunes and try to win one of our delicious cakes at the Cake Walk! Wristbands are $30 and cover all rides. These are especially good for the younger kids so they can go on rides continuously without having to keep up with tickets. Tickets may be used for everything including all rides, all games, food and drinks. One sheet of 20 tickets costs $10. You can pre-order tickets/wristbands via the Field Day One-Stop Shopping (OSS) webpage from February 19 - March 21. Pre-ordered tickets/wristbands will be available for pick up Thursday, March 28 from 2:00 - 4:00 p.m. and Friday, March 29 from 7:30 - 10:00 a.m. at Harrison House. Don't forget to also bring cash or a check to purchase raffle tickets during the pre-order pick up times and in morning carpool the week of Field Day! Don’t worry if you forgot to pick up your pre-ordered tickets and wristbands! You can pick them up at the Ticket Booth on Field Day. Tickets, wristbands and raffle tickets will also be on sale all day on Field Day, both in front of the school at the ticket booth and on the field during the field events. Upper School pre-orders will be available during their Field Day lunch period. To volunteer, login to The Kinkaid School website Parent Portal, click on the SignUp Genius link, then click on Field Day. There are many volunteer opportunities for this big and fabulous event! You can sign up for set up, to be a general volunteer or sign up for your grade level booth! Check the volunteer website to see the many volunteer opportunities. To donate items for the Raffle or to help with underwriting, go to the Field Day OSS website. Thank you for your help! The first Field Day was held in 1925 at the Elgin campus. It was expanded at the Richmond campus, where in 1937, with a new gymnasium, Field Day became larger than ever, including folk dances, father-son softball games, a mother-daughter dance, and even a Middle and Upper School dance. Also, it was customary for the seniors to walk out with the kindergarten students when opening Field Day, a tradition that continues today with the Upper School students accompanying their Lower School buddies. Thanks to the efforts of a parent volunteers, Field Day continues to bring the Kinkaid family together. It has become a significant fundraising event, with proceeds going to support academics, arts and athletics.